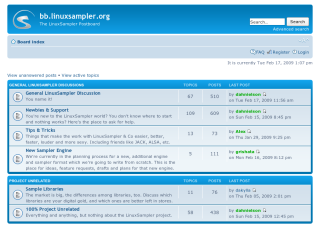 Join the linuxsampler-devel mailing list for general discussions about LinuxSampler, development, bugs, patches, user questions, etc. Every now and then you can meet us at the #linuxsampler IRC channel at freenode.net, you can use this webinterface to join the #linuxsampler channel with your web browser. Please do NOT send us any user questions to one of us directly! We have a) a web forum and b) a mailing list which you are invited to use for any kind of user questions (see above). Sorry, but since people began to send more questions to us directly than using those platforms, we are now very strict and will simply ignore any kind of user question sent to our personal email addresses. The deal is: you ask questions on those platforms (web forum or mailing list), and in turn you answer questions of other users later on. If we forgot to mention you here, we apologize. We will add you immediately when you tell us!